The island of Boca Grande is nestled between Naples and Tampa on the Gulf Coast of Florida. A historic resort to wealthy New Englanders, Boca Grande to this day remains secluded and untouched by the masses. With over seven miles of pristine beaches and world class fishing, it is surprising that this island oasis has remained unspoiled by the hustle and bustle of traffic and tourism. Boca Grande is a unique island unlike any other in the world. Old Florida at its finest, Boca has a strong sense of community and beauty all its own. We welcome you to join us on the island, and hope you'll find it as incredible as we do! Enjoy your time down here! And enjoy the fantastic fishing! From the North: Take I-75 South down to Venice, FL, at exit 191, veer right at the exit onto River Road. Follow River Road until it turns into Dearborn Street. At the intersection of Dearborn and Pine St., turn left onto Pine. Follow Pine St until it crosses S.R. 776. Keep traveling forward as Pine St. turns into S.R. 775 (also known as Placida Road). Continue on Placida Road until you reach Gasparilla Road which will be to your right. Follow the signs to the Boca Grande Causeway. 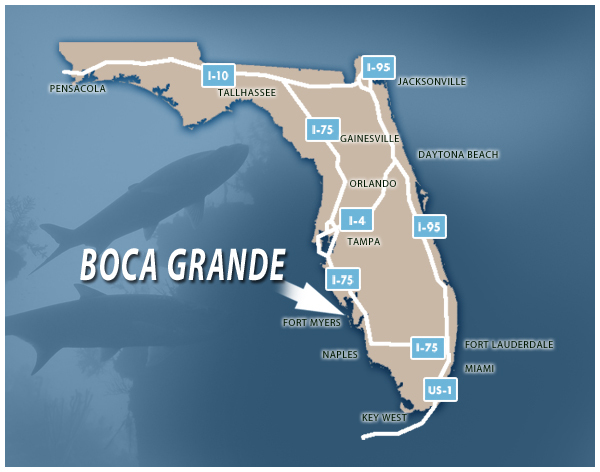 Once you are over the bridge, you are in Boca Grande! From the South: Take I-75 North until you reach exit 164 for US-17 S toward Punta Gorda. Turn right on US 41/Tamiami Trail N for approximately 8 miles. Turn left on FL 776 towards El Jobean. After roughly 8 miles on 776, turn left on Route 771. Follow 771 until you reach Gasparilla Road and turn left to go over the Boca Grande Causeway.